Shipping Corporation of India Limited has released notification for the recruitment of Graduate Marine Engineer posts. There are about 40 vacant positions for which the notification is released. Candidates who are interested should go through the official website or follow the link given below to download the notification and find more details regarding the recruitment. The Shipping Corporation of India (SCI) is a Government of India Public Sector Enterprise with its headquarters in Mumbai that operates and manages vessels that services both national and international lines. SCI was established on 2 October 1961 by the amalgamation of Eastern Shipping Corporation and Western Shipping Corporation. Two more shipping companies, Jayanti Shipping Company and Mogul Lines Limited, were merged with SCI in 1973 and 1986 respectively. This year it has released notification for the various posts. Candidates should download the notification and find more details regarding the eligibility criteria. The criteria include educational qualification, age limit, application fee, selection process, etc. If meet the criteria candidates can proceed further to apply online. Candidates should visit the official website and find the link to download the application form. Fill all the required details and proceed to pay the application fee. Candidates should upload the documents if necessary. Save a copy of application form for further assistance. The candidates should have to possess Bachelor`s degree or diploma from a recognized or Institution. Other details can be found in the official notification. Candidates should have a minimum age of 28 years and not more than that. Other age relaxation details can be found in the notification. Candidates who belong to the general category should have to pay Rs. 1000 and other reservation candidates should have to pay Rs. 500/-. The candidates who attended the exam will be selected in two levels which is mandatory for all the shortlisted candidates. The two levels will include Personal Interview and medical examination. How to Apply For SCIL Recruitment 2017? 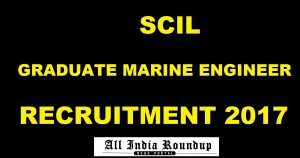 Click on SCIL Recruitment 2017. Stay tuned to this website for more details regarding the SCIL Marine Engineer recruitment 2017. Press CTRL+D to bookmark this page for more exciting updates.